Downy mildew of impatiens is caused by the oomycete Plasmopara obducens. It has been reported sporadically in garden impatiens since 2004 but it wasn't until 2011 that widespread outbreaks were observed in landscapes in Massachusetts. This disease affects the garden impatiens Impatiens walleriana, the tropical species I. balsamina, and the jewelweed species I. pallida and I. capensis. New Guinea impatiens (I. hawkeri) is highly resistant. Seedling cotyledons, young plants, and immature plant tissues are most susceptible to infection. Plants may be stunted and and cease to flower. Symptoms typically start with a few leaves that appear slightly chlorotic or stippled and become completely yellow over time. Some varieties will have subtle grayish lesions on the upper leaf surface. White, fuzzy growth eventually appears on the undersides of leaves. Leaves eventually drop, leaving bare stems. I. walleriana is especially susceptible to downy mildew and plants may collapse rapidly. Other susceptible species may have only mild foliar symptoms and continue to flower. Short-lived spores called sporangia are produced by the downy white growth on the undersides of infected leaves. These spores will not overwinter but are spread to other plants by wind currents and splashing water. All downy mildew pathogens require a film of moisture on plant leaves in order to germinate and infect the host. It can take 5 days to 2 weeks after infection before plants show symptoms, depending on environmental conditions. Long-lived spores called oospores are produced inside infected plant tissues and are released into the soil when infected plant debris degrades. Oospores can survive and potentially initiate new infections on Impatiens walleriana planted into the same garden beds for many years. It is not known how long oospores of Plasmopara obducens will survive in the soil. Oospores of other species of Plasmopara are known to be viable for 5-10 years. Research has shown no evidence of seed-borne transmission. Development and expression of impatiens downy mildew is highly influenced by the weather. Wet foliage, cool temperatures (especially at night), and moist air are ideal conditions for disease development. 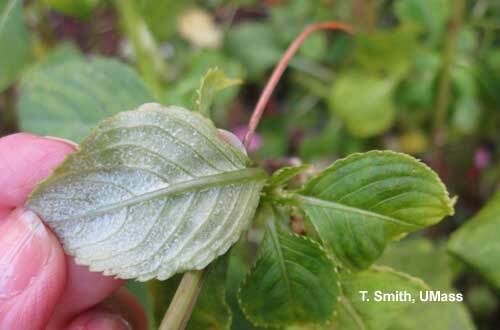 Impatiens downy mildew is best prevented by implementing good cultural management practices. Carefully inspect incoming plants for signs and symptoms of disease, and do not allow unhealthy plants into the greenhouse. Decreasing relative humidity and leaf wetness in the greenhouse is of utmost importance. This can be accomplished by heating and ventilating, along with increasing horizontal air flow. Space plants appropriately to decrease humidity in the canopy and facilitate rapid drying of leaves. Avoid overhead watering if possible. Impatiens downy mildew is not known to be seed borne, so if possible, keep seed and vegetative impatiens in separate greenhouses in the future to prevent cross contamination. Remove wild impatiens (Jewelweed, I. pallida and I. capensis) from around greenhouses and production yards and do not plant garden impatiens in landscapes around greenhouses. Scout regularly for signs and symptoms of disease. 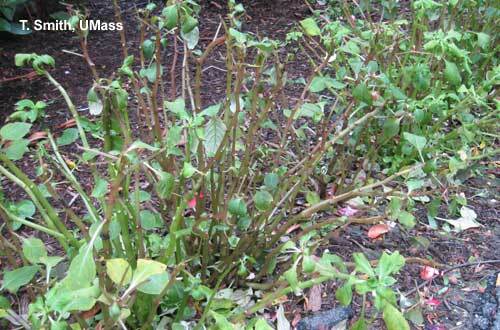 Remove and dispose of any infected Impatiens walleriana plants. Asymptomatic plants close to infected plants should also be removed. When discarding the plants, bag and remove the entire plant including the soil and any plant or soil or leaf debris. Do not compost. In the landscape, all parts of any infected plants should be removed, including roots and any fallen leaves. The area should not be replanted with susceptible garden impatiens species. No resistant varieties of I. walleriana are yet available, so landscapers and home gardeners are advised to consider including alternatives to garden impatiens into their landscape plans. Impatiens hybrids such as SunPatiens and the Bounce series are downy mildew resistant. Other suggested annual plants for shade include winged begonias (DragonWing, BabyWing), bronze-leaf and green-leaf fibrous-rooted begonia, tuberous-rooted begonia, lobelia (upright and trailing) and torenia. Shade annual plants with colorful foliage include, caladium, begonias, coleus, hypoestes and iresine. Catlin, Nora. Alternatives to Garden Impatiens Chart. M. Bess Dicklow, 2013; Revised by Angela Madeiras. Photos by Tina Smith.